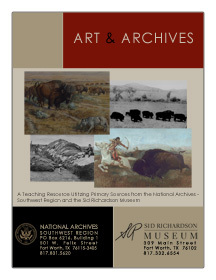 The ART & ARCHIVES teaching resource is a series of ten lessons developed to enable teachers to bring the experience of the American West to life for their students by linking the rich primary sources from the Sid Richardson Museum and the National Archives and Records Administration - Southwest Region. Primary sources from the National Archives include letters, manuscripts, census data, treaties, photographs, and Medal of Honor applications. The artworks from the Sid Richardson Museum, painted by the premier artists of the American West, Frederic Remington (1861-1909) and Charles M. Russell (1864-1926), can be appreciated for their artistic merit and for being sources worthy of historical investigation. Lessons are ancillary, designed to be used within larger units of study on topics relative to American History. Several of the lessons include more than one activity; educators may wish to select only a few of the exercises based upon their specific classroom goals. Lessons align with the Texas Essential Knowledge and Skills (TEKS) for Social Studies and/or History in grades 5, 8, and/or 11, but can be adapted for various grade levels and subjects. Every lesson incorporates the study and analysis of artwork and aligns with TEKS for the Visual Arts, addressing the strands of Historical/Cultural Heritage and Response/Evaluation at all grade levels.